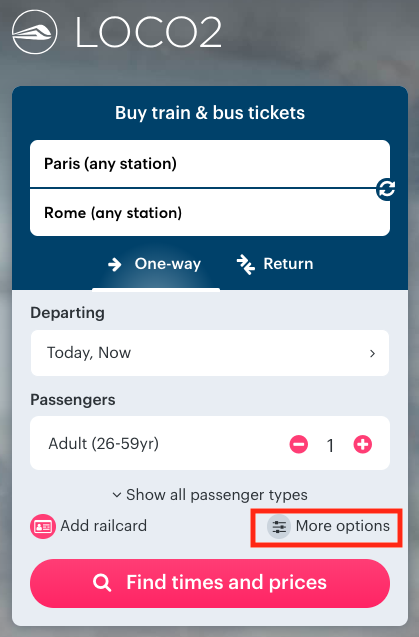 You can edit your search using the "More options" tool if you feel that the recommended time (interchange or transfer) between connecting trains is too short, or you wish to build in time for another reason - perhaps lunch in Paris or take an overnight stay en route. When you select "More options" you will be asked to specify the station and the length of time you want to spend there. Add a couple of hours for lunch, or several days if you prefer. If you just want to spend the night and continue your journey the next day, you should enter 12 to 16 hours to see trains the following morning. 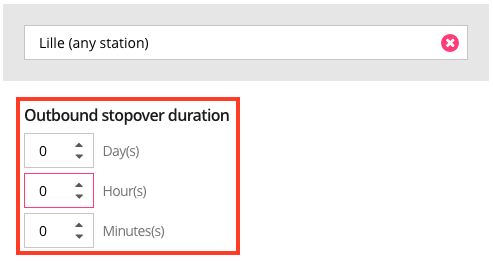 You can do the same for a return search, and set a different amount of time for the return journey if you wish. However, it is not possible to set a different "via" station for outbound and inbound journeys; the origin and destination must be the same. This tool can also be used to reduce the amount of time between trains, but should be used with caution. Please be advised that, in the case of international trains, your trip may not be covered by CIV rulesif you opt for a very short interchange. The "More options" functionality can be used to go via a specific station, for example by choosing a Eurostar train to city in France, but travelling via Lille instead of Paris. If you aren't sure how long is required to change trains, you can leave the duration blank and we'll check if the rail operator returns a recommended duration. If this doesn't work (if it's not a typical route for your start/end stations) then you may need to specify an amount of time. If the route is possible, we'll show results via your chosen station. However, bear in mind that going via a particular station does not necessarily prevent your journey from going through another place. 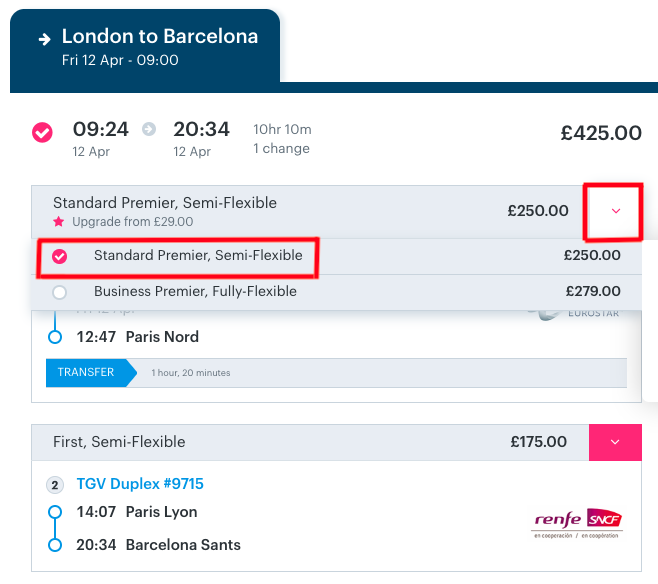 For example, a search from London to Nice via Lille will show results from London to Lille/Lille to Nice, but it may also show trains from London to Lille/Lille to Paris/Paris to Nice. Check the results thoroughly to make sure you get your preferred route. Tickets that include travel on more than one train are often bundled together so that you have the same class for the entire journey. However, sometimes you might want to mix and match the travel class. For example, travel in Standard Class on Eurostar then switch to First Class for the next leg of your journey. To do this, click on the drop down box as illustrated below and choose the class of travel for each leg of your journey. Sometimes searches fail when you enter a via station. We outline the basic troubleshooting steps below, but read Troubleshooting a failed search for more details. Choose 'Any Station': If you're going via a destination with more than one station, your trains may not arrive and depart from the same one. If you're any doubt, choose an 'Any Station' option if it's available. Check the route: It may not be possible to go via your specified station. If you aren't sure, try searching for each leg separately to make sure it's possible and make a note of train times and departure/arrival stations. Check the route the other way: Often, it's possible to go via a specific station on the way out, but not on the way back. This varies depending on the timetable and season, for example there are very few direct trains from Nice to Lille in winter months. As above, try searching for each leg separately to make sure it's possible then modify your return search accordingly.